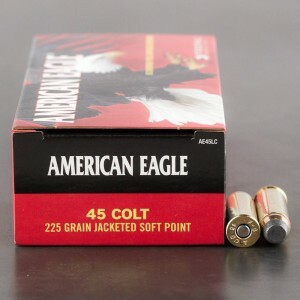 Soft point 45 Long Colt ammunition has always been implemented not only as a revolver round, but as a rifle round. The 45 Colt has found it’s way into many lever action rifles. The round has found itself to be an excellent short-range brush gun, perfect for hunting in thickets. The 45 Colt soft point loads make an interesting hunting load. Soft point ammunition has long been a preferred hunting load for its ability to both penetrate and expand. The round tends to mushroom and deform when striking the body of a soft target and this creates a larger wound channel to guarantee a quick and humane kill. Came fast and easy. Bought it for the Taurus Judge, Public Defender with the snub nose. The .45 LC are five inches left at 33 feet. Dead on at 7 feet. With the buckshot, at 7 feet the pellets don't have time to release from the plastic sleeve. That's expected with almost no barrel. I got of for birdshot anyway and a snake gun in the tackle box. Perfect gun for that.